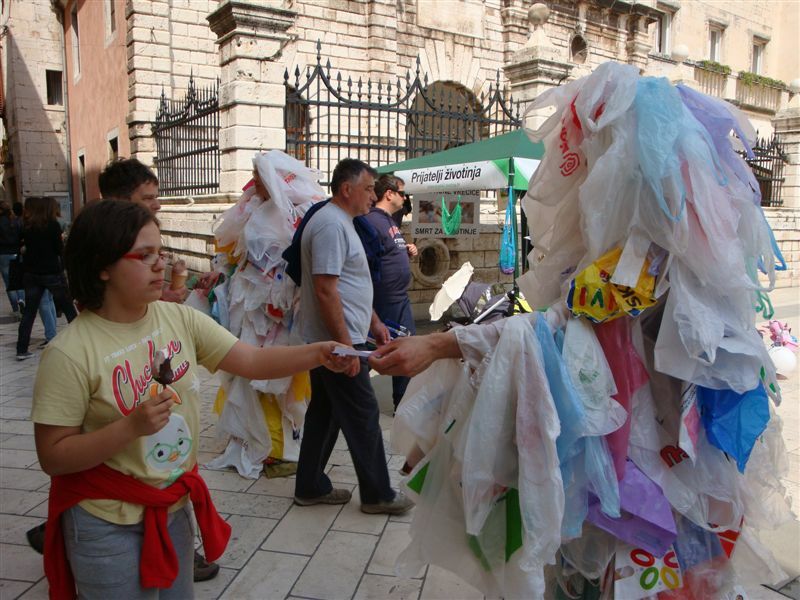 On April 14 at 12:00 noon, "bag monsters" will distribute leaflets at Narodni trg in Zadar. They will also invite citizens to sign a petition to ban plastic bags, for which has been collected more than 20,000 signatures so far. 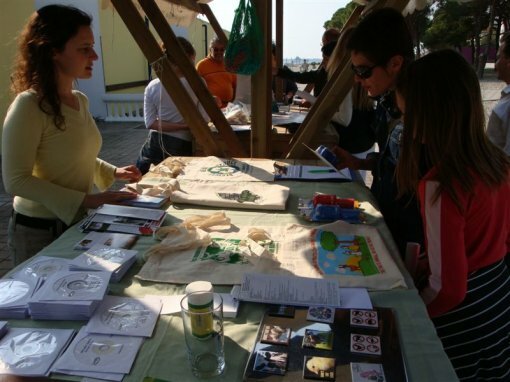 Various educational printed and video materials will be available at the info stall, which will be open for visitors from 10:00 a.m.
On the same day, at 7:00 P.M., in the Scientific Library of Zadar a lecture entitled "Connections between Animals and the Environment" will be followed by the short film "Their Future in Your Hands." 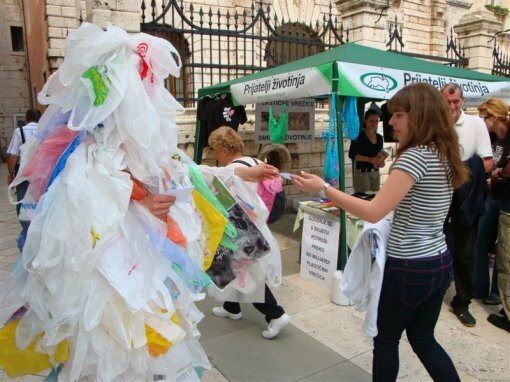 Each year, more than 500 billion plastic bags are discarded worldwide and most of them end up in natural habitats. Hundreds of thousands of animals die each year because of these plastic bags, either by mistaking them for food, or by becoming entangled in them. Plastic bags require decades to decay into smaller pieces and eventually end up as plastic particles of dust, all the while polluting the environment. Recycling plastic bags is expensive and complicated. Only about 1% of bags are recycled. Even a considerable increase in the recycling of plastic bags would not solve the problem of their uncontrolled production, which requires vast quantities of natural resources and emits toxic chemicals into the environment. The countries of China, South Africa and Israel as well as the cities of San Francisco and Los Angeles have already banned the free distribution of plastic bags. In 2002, Ireland was the first country in Europe to introduce a special tax on plastic bags and their use has meanwhile decreased by 90%. If every fifth citizen of Croatia stopped using plastic bags, the next generation would have 199,588,400,000 less plastic bags in the environment. 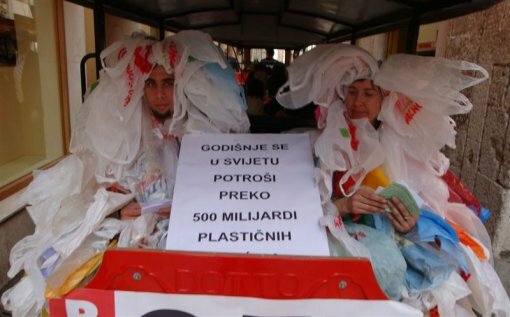 A single cotton bag can substitute for a thousand plastics. Animal Friends appeals to citizens to use cotton and net bags, baskets, and the like, and to refuse any free plastic bags that are offered in stores. 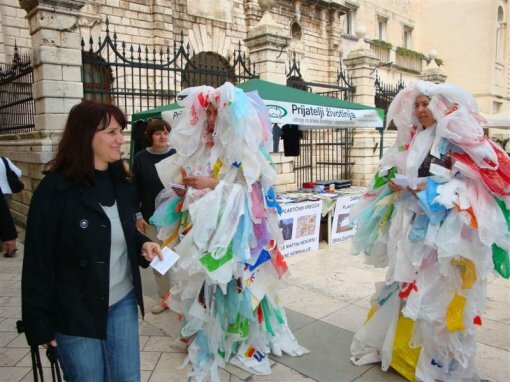 Citizens are also invited to sign the petition to ban plastic bags, which would result in saving numerous animals from painful deaths as well as spare the environment from pollution and disfigurement. Such a ban would also have a huge educational impact since it would teach people not to consume all that can be produced, and it would also promote further steps in saving our planet. We save our environment by buying things that can be used multiple times, sorting refuse for recycling, disposing of dangerous waste in appropriate manner, and so on. We can also help our environment by shifting to meatless nutrition, since the production of vegetarian foods requires far less natural resources than breeding animals for food. Meatless nutrition saves considerable quantities of water and energy, helps diminish global warming and environmental pollution, and helps fight world hunger. On the following day, April 15, Animal Friends will organize an event entitled "Don't Abandon Me – Adopt Me," in cooperation with the Municipal Administration of the City of Biograd na Moru. The aim of the event is to draw public attention to the legal obligation of helping abandoned animals, to condemn the abandoning of animals, and to educate the citizens about this widespread problem. 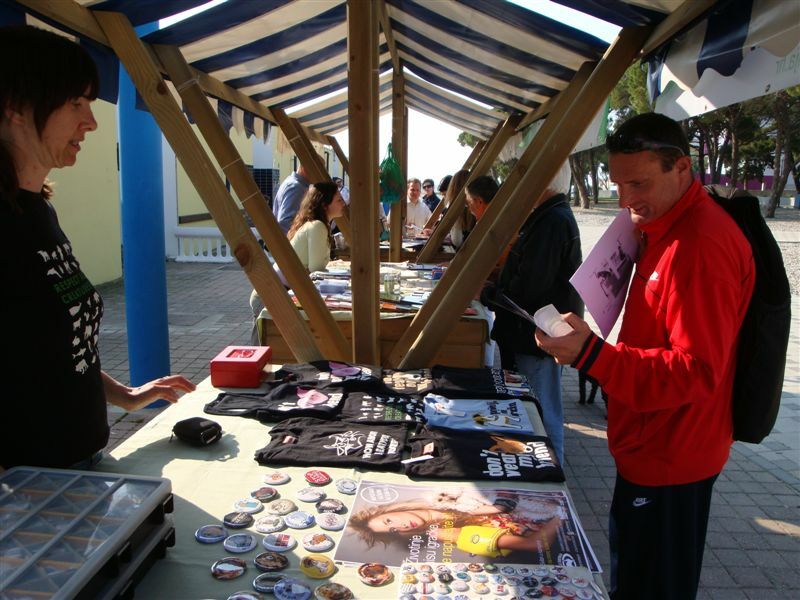 After participation in a meeting of the Municipal Administration of Biograd na Moru, Animal Friends will set up an info-stall next to the city swimming pool at 2:00 P.M. Visitors will obtain educational materials and information about the Animal Protection Act and its implementation, and they will have the opportunity to sign the petition for modifying the Rulebook on Dangerous Dogs and introducing mandatory micro-chipping of all dogs, regardless of their age.